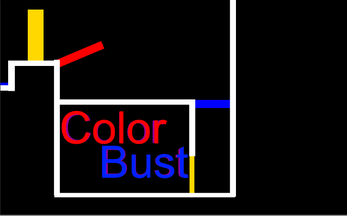 ColorBust is a puzzle simplistic puzzle platformer turned into a nightmare. The gameplay and character elements most closely relate to that of super meat boy with its fast paced platforming strategies however its incorporated with a color system forcing you to switch between colors while jumping from platform to platform, avoiding all possible dangers along the way. Dangers from spinning objects of opposite colors or turrets shooting items forcing you to switch your gravity. The game will have you screaming in anger yet still slightly amused and willing to try at it one more time to get past each individual challenge along the way. W, A, S, D or Arrow keys to move and jump. Space, Q or Left Mouse to switch colors. Remember there is double jumping and wall jumping. Controls for a game pad are in the game already.